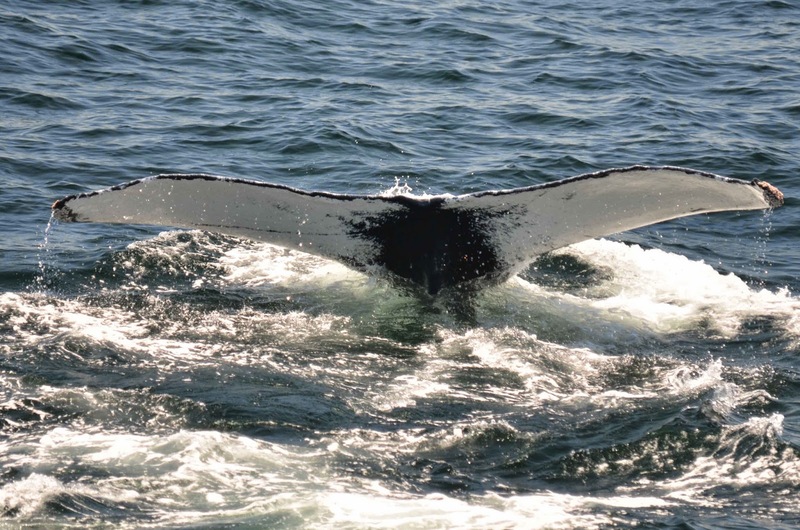 On today’s 12pm whale watch aboard the Cetacea, we headed towards mid-bank in search of whales. We first came upon a rather large, fast traveling fin whale. We observed this individual traveling over a mile in quite a short amount of time! The whale then appeared to be foraging as it changed direction quite frequently, and we left it to continue the the NW corner of the bank. On the NW corner we found a few minke whales, as well as male humpback Mogul to make it a three species day! 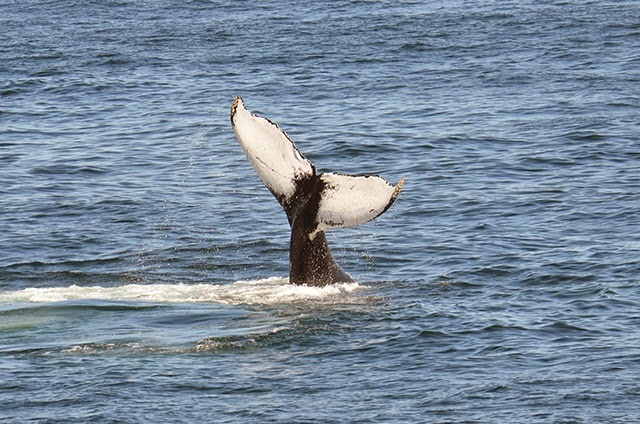 This 28 year-old whale was busy subsurface bubble cloud feeding, and gave us great looks of his white fluke. 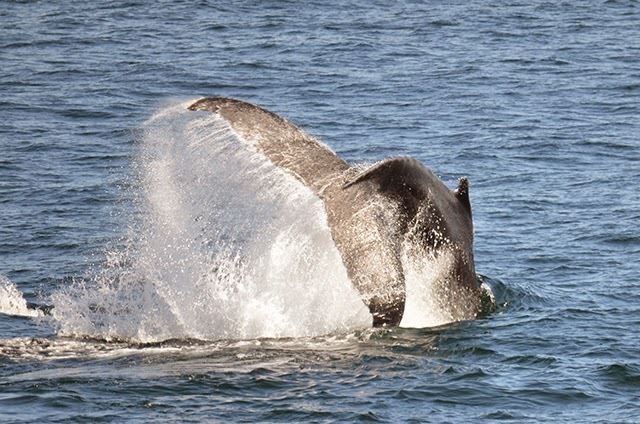 He also had an impressive tall blow today, compared to the more typical “light-bulb” shape a humpback normally has. Also on our fish finder, we tracked many huge bait balls, with prey going deep down as 200 feet! Overall a nice sunny day on the water! Today on board the Asteria for the 1:30 pm whale watch, we headed out towards the Northwest Corner. Once we made it to the bank we saw a lone minke whale. We enjoyed a few surfacings with this individual before continuing on our search for some larger whale species. Visibility was fantastic today and the crowd on the bow had no problem pointing out a blow in the distance. Once we got closer to the blow we were able to determine that it was indeed a humpback whale. Once we saw the fluke we confirmed that it was Mogul, a male humpback. I thought it was fitting to mention that male humpbacks are not very active in the upbringing of their offspring which makes it nearly impossible for us to determine the father of any calf that we see. It is possible that Mogul could be a father to many calves, however it seems as though none of his offspring came to visit him today on Stellwagen for Father’s Day. Throughout the trip, Mogul consistently fluked and took 4-5 minute dives. At one point early on in the trip, he exhibited some exciting rear behavior, even a massive tail breach! It was an absolutely beautiful afternoon out on the water today. We had fantastic Father’s Day whale watches on board the Aurora today for our 10am and 3pm trips! Today we went to the northwest corner of Stellwagen Bank where humpback whale Mogul was doing some subsurface feeding. 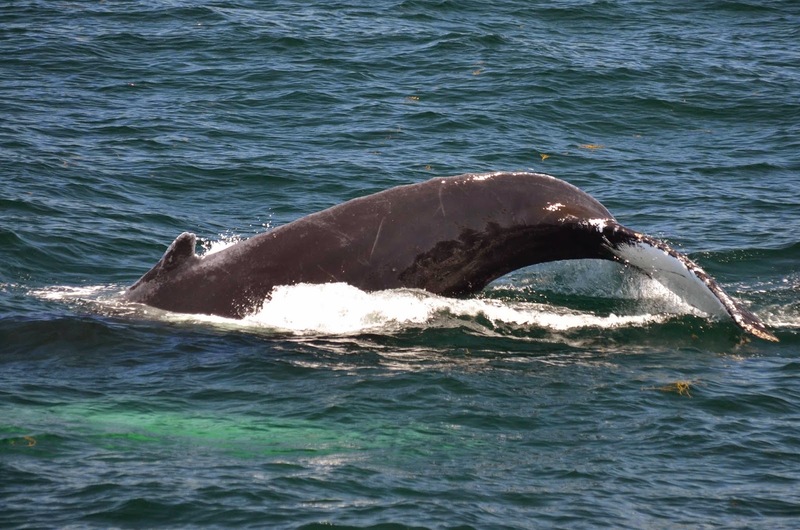 Born in 1986 to Parrot, Mogul is a 28 year old male humpback. Today, Mogul was diving solo down to the sandy edge of Stellwagen Bank most likely in search for sand lance. He was making high fluking dives and, after about four minutes, surfacing with a bubble cloud. On our morning trip, there were also a few minke whales in the area but none to be seen in the afternoon. As we slowly cruised up to Mogul this afternoon, he was doing some flipper slapping but quickly went right back to his clockwork dives. On our last look of the day, Mogul treated guests to a close surfacing right next to the boat! It was a perfect end to a beautiful day out on the water!